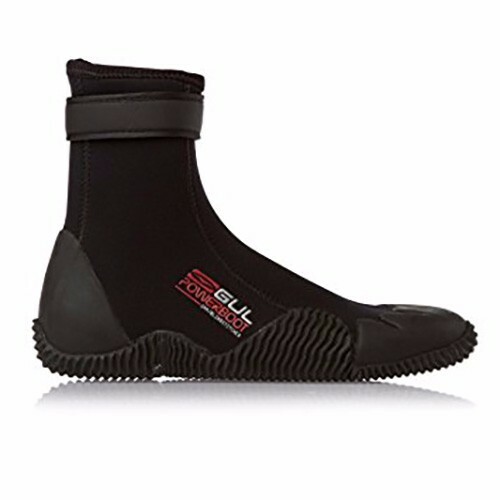 Gul Power 5mm Neoprene Wetsuit Boots historically always our most popular general watersports boot extremely versatile, pull-on, multi-purpose neoprene boot. An extremely popular, simple and very adaptable boot, great for a multitude of activities, particularly surfing, windsurfing, kitesurfing, bodyboarding, stand-up paddling, snorkelling, dinghy sailing and even scuba diving or just messing about in boats or on the beach. Gul 5mm Strapped Power Boot extremely versatile, multi-purpose neoprene boots and the most popular design of multi-activity watersports boot we sell. Featuring 5mm Dura-Flex neoprene for flexibility and Titanium II neoprene for improved warmth retention. Reinforced heel and toe for durability.